For some time, I've been working on this third of four posts for my series on Vitality. But our museum's director, Chris Flink, gave a related talk yesterday that renders this post timely. So I got off the proverbial pot. If Ambiguity and Complexity are states of our world, Adaptive Work is the means by which we forge a path from one state of Complexity to a higher one, through Ambiguity. To learn as an individual or a group, we must stand upon the scaffolding of past endeavors, i.e. formerly understood “patterns of patterns,”  and strive toward ever-greater understandings. In this way, Adaptive Work is learning done to move from one state of Complexity to a more general and higher-order state of Complexity. But the Adaptive Work pathway from one level of Complexity, say a brainstorming exercise, to another level, say the synthesis of many ideas into patterns of ideas, is not a trivial exercise. As alluded to at the beginning of the last blog post, there are many tensions, many distractions and paradoxes, on the path of learning. To better understand Adaptive Work, and group learning more generally, I’ll start with the story of the Blind Men and the Elephant, originally an Indian parable. The story goes that a number of blind men, or men in the dark, explore different parts of an elephant. In reporting what they’ve found, they disagree on the nature of the elephant. One finds the leg like the base of a tree, while another finds the tusk like a spear, while still another finds the trunk like a snake. They quarrel, each insisting that his perception, and subsequent understanding, of the creature is the correct one. Each is motivated to better understand his world, and may believe that they have a common goal: to understand the object before them. But we are individuals first, and social creatures second. The prisoner’s dilemma, as exhibited by the Science of Sharing in our West Gallery, shows how humans tend to default to our own personal outcomes, because we tend not to trust our fellow learners. This is a form of “blindness” or “darkness.” Since each does not know with certainty the intention of the other, we have a cognitive bias for our own interpretation. Of course, our better selves know that many integrated perspectives are better than one. So where is the balance between the understanding of the one and that of the many? How does the collective assess the validity of the single observation and integrate many diverse understandings into one more general, Complex and meaningful understanding? Let’s call this the Paradox of Understanding. These two behaviors are different, because the former isolates and objectifies single patterns, distinguishing that which separates each individually from its surroundings, while the latter does the opposite by discerning what each pattern has in common with other distinct patterns – in essence, discerning and constructing our “patterns of patterns.” Put another way: 1) is divergent in how it expands possibilities, whereas 2) is convergent as it tries to find the common themes that bring the patterns, e.g. ideas, together. Still another way: 1) tends to create disorder and Ambiguity, while 2) tends to conjure order and Complexity. The more general adaptive behavior of Adaptive Work entails the capacity to learn both many diverse patterns while also learning useful relations among these patterns. For example, redness, smoothness, and roundness are all useful attributes of food items to perceive; however, these distinct attributes must be interrelated in a unified higher-order pattern in order to conceive of “apple-ness.” Knowing infinitely many accurate independent things is far less useful and adaptive for the organism than knowing only some things plus their inter-dependencies, as one. To do this in practice, we need to exercise two very different behaviors. To do this, our team uses design-based learning and creation. One way to think of this process is the act of throwing thousands of threads on the floor like a Jackson Pollock painting. Each thread represents an idea, a community member’s story, an inspiration, a physical constraint, our mission and vision here at the Exploratorium. Our job is to populate this terrain with each specific observation and intent, like the blind men. This is the first half of our Paradox of Understanding, and necessary discovery for learning. Next, we must endeavor to harvest the Adaptive Work pathways from this terrain. We try to notice the interrelations among threads, the patterns of patterns, so to speak. This is the second aspect of our Paradox, and a distinct mode of behavior needed to navigate the terrain. A constructive pedagogy needs both the expansion of our available knowledge and the ability to perceive the order in the chaos. But, as Chris Flink suggested at this week’s All Staff, these two behaviors, or “modes,” are distinct. 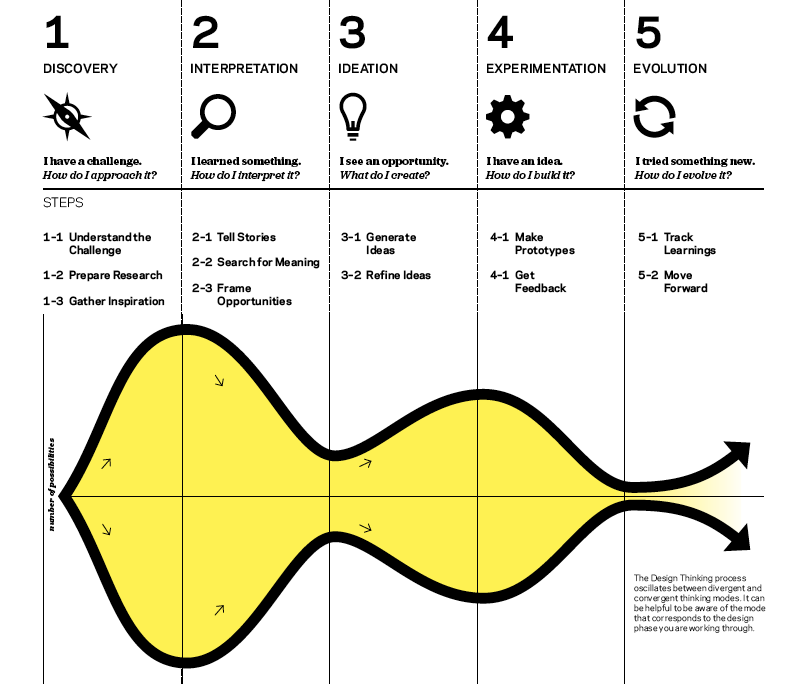 I’ve adapted an IDEO design thinking diagram to illustrate how these distinct behaviors can work together in a series of cycles to achieve Adaptive Work. First and foremost, our design practice must generate a requisite variety of perspectives and patterns on everything from people’s stories about their social community or a local natural phenomenon to what the question is to be answered; this is born out of the team’s initial empathetic research, and it endeavors to not provide an answer. It is not a map of some fixed path and preordained destination; it is a terrain to be discovered. As our project starts, we are the blind men and we’re not sure we’re after an elephant in the dark, so we explore. It is a divergent mode of behavior. It is a time for more action and less reflection, which can sometimes overwhelm people with many options and perspectives. Then, through different constructive team exercises, conversations and documentation, many relationships among the above research assets are discovered. These patterns of patterns help evolve the question or design intent: what are we trying to solve or contribute to, and what would be considered a successful outcome? This is a convergent mode that requires some reflection to harvest the Complexity from the noise. The above steps constitute one cycle: an opening and then a focusing, an expansion followed by a distillation, a divergence and then a convergence. However, at this time, we still have no design answer or solution. Ideally, we have a more refined intention, and it is this intent along with our research that constitutes the scaffold upon which the next cycle is elevated. Reflecting on documentation from the first cycle, a new variety of patterns and questions is discovered. For example, through our research, we may have realized a number of use cases: scenarios and circumstances where distinct types of visitors will find themselves at our exhibit and/or installation. In addition, we often generate simple diagrams that interrelate a program and site elements we may have researched in the previous work cycle. With these use cases and programmatic diagrams before us, we can step back and reflect to discover the more Complex patterns of patterns. For example, using our evolving design intent as a compass toward relevance and success, we navigate the dynamic design terrain of interdependent use cases and design constraints, all the while conjuring experiential circumstances that express the Exploratorium’s mission and vision. We’ve now completed another cycle. We can do an arbitrary number of cycles integrating any manner of constraint types depending on our scope, budget and timeline. Each cycle can increase the relevant and useful Complexity of our solution by taking the result from the previous cycle and actively infusing more relevant constraints and opportunities; these might be structural constraints, municipal code requirements, engagement of newly discovered stakeholders, and many more. Together, these cycles ratchet and feed off each other to constitute Adaptive Work. Ambiguity is risk, but engaging it is also a precondition for learning and adaptation. The point of a good design process isn’t about the one right answer, or getting rid of Ambiguity; it’s about actively engaging Ambiguity to remain relevant. There is no other way to discover viable outcomes in the physical and social world. There is no static model or map that we can use for every unique project in a dynamic and indeterminate world. Having embraced Ambiguity, Complexity is what we learn about the world in a given moment, learning patterns of patterns. Adaptive Work is how we get from one state of Complexity to a higher state, challenging our preconceptions every step of the way. It’s the continuous path from one moment to the next. But Adaptive Work does not happen in a vacuum. It happens in a dynamic ecosystem of people and institutions, each with its own predisposition and culture. Vitality is about creating the safe space to facilitate self-reinforcing Adaptive Work Cycles. Vitality is about the who, where and ultimately why—the subject of the fourth and final blog post in this series. Thanks for hanging in there, and hope to have you back for Vitality!